Descriptions We made an indoor thermometer of high-quality, durable materials so that you can easily and quickly determine the temperature and humidity in the room you need. -A stylish, weightless design is used in the digital humidity monitor with Digital Alarm Clock. -A convenient and easy-to-use wall thermometer. -A large, multifunctional, informative digital humidity monitor, so you can get the information you need even from a distance. -Easy and quick for a couple of touches, the necessary information is displayed on the screen. -Indoor thermometer saves the minimum and maximum values of air temperature and humidity during the day. -Digital humidity gauge shows the exact time and conveniently set the alarm (every day / hourly alarm function). -A loud signal in the humidity meter, it will be heard even in the next room. -A very accurate sensor located in the hygrometer digital will help you to determine the temperature or humidity in the room to the tenth degree (percent). -A wide range of measurement of air temperature from 32F to 160F and air humidity from 10% to 99%. -The temperature and humidity indicators with the new wall thermometer are updated every 10 seconds. -Convenient fixings of room humidity monitor will allow quickly and easily install it on any surface in the room. -Dimensions: 3.8 inch (9.5cm) x 0.9 inch 2.2 cm) x 3.8 inch (9.5 cm). -Indoor Temperature range: 50˚F to 158˚F (10˚C to 70˚C). -Humidity Range: 10% - 99% RH. -Temperature Display Resolution: 0.2 ° F (0.1 ° C). 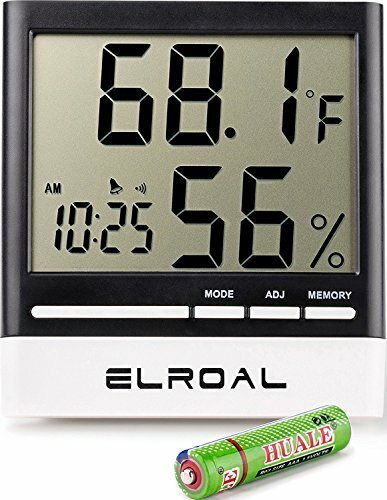 -Temp Accuracy: ± 2 ° F / ± 1 ° C.
Multifunctional - In humidity monitor, you can see the exact temperature of the indoor air on the big screen(Celsius or Fahrenheit), humidity and exact time. You can also use hygrometer digital as an alarm clock. High-quality Thermometer - Humidity monitor uses a high-quality sensor inside the hygrometer, which exposes the data every 10 seconds. It accurately and quickly measures the temperature and humidity inside in the room. LCD Monitor - A large, functional display in humidity gauge & temperature with bright light, will always help you to read the information you need, even from a distance. Stylish Design - Thermometer hygrometer is super convenient and multifunctional. It has lightweight with the bright large digital screen, simply functional and understandable control, convenient fastening. It will look great in the most refined house. Convenient Fasteners - inside the thermometer you can use several types of fasteners, which will help you easily install it in any room. If you have any questions about this product by Elroal, contact us by completing and submitting the form below. If you are looking for a specif part number, please include it with your message.